FILE - View to the brown coal power plant of German energy company RWE in Neurath, western Germany, Aug. 27, 2007. As Germany executes what may be Europe’s most ambitious transition to clean energy, the dirtiest form of coal-fired power has held fast to a major share of the country's power supply. Meanwhile, some of the most efficient gas plants in Europe are shutting down. New legislation aims to correct the situation and bring the country’s greenhouse gas emissions in line with its climate targets. Critics call the measure a massive handout to the electric utilities. But it seems to mark a transition. Experts across the German power industry say the end of lignite coal is in sight. 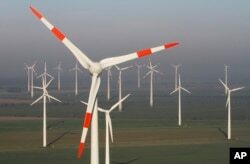 FILE - Wind turbines produce green energy in Nauen near Berlin, Germany, Oct. 12, 2012. But rather than replacing lignite coal -- Germany’s largest, dirtiest and least-efficient source of fossil energy -- it’s clean-burning gas that has taken the hit. “When you thought about energy transition some years ago, the gas-fired power stations were expected to be the perfect partners of renewables,” said Vera Bueke, spokeswoman for the utility company RWE. Gas plants can be switched on and off quickly in response to fluctuations in supply from wind and solar, she explained. And they produce the least CO2 of the fossil facilities. “But in fact, they are kicked out of the system because the power prices now are so low,” she added. Solar panels and wind turbines produce electricity for next to nothing. There’s no fuel to buy and no plant operators’ salaries to pay, so the electricity they produce is the cheapest available on the wholesale market. And Germany has abundant domestic supplies of lignite coal. So power plants burning locally-mined lignite can produce electricity for roughly half the cost of gas. Europe’s carbon-emissions trading system was supposed to price CO2-intensive lignite out of the market. But carbon prices are too low, and falling. Last year, prices were less than half what they were in 2009. With demand drying up for relatively expensive natural gas-fired power, utilities have been closing or mothballing many of their plants -- including ones they just built a few years ago. In March, German utility E.ON announced plans to idle a highly efficient gas plant that went online in 2010. Meanwhile, even as renewables have mushroomed, lignite coal has held on to roughly a quarter of the overall energy pie. The persistence of lignite threatens Germany’s climate goals. The country had committed to cut its greenhouse gas emissions by 40 percent from 1990 levels by 2020. But “the government found that there was a gap,” said Patrick Graichen, head of the Berlin-based energy think tank Agora Energiewende. The country would fall short of its goal by 22 million metric tons of CO2. “There was the clear need for some sort of additional measure or it would be clear that Germany wouldn’t be meeting its 2020 targets,” said Graichen. That measure, which the government approved Nov. 4, puts production at eight lignite power plants -- about one-seventh of the country’s lignite capacity – on hold. At the end of four years, these facilities are to be shut down. The owners will receive 1.6 billion euros to keep the plants idle. “We had a better proposal,” acknowledged State Secretary Rainer Baake at the Federal Ministry for Economic Affairs and Energy. The government’s original plan was to charge lignite plants a fee for their high CO2 emissions. But trade unions took to the streets in protest, claiming it would drive the plants and the mines that supply them out of business, cost 100,000 jobs and devastate coal-mining regions, especially in the former East Germany. 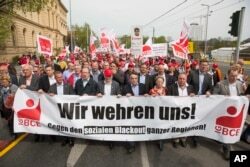 Coal miners and energy workers took to the streets of Berlin to protest a planned tax on emissions from lignite coal plants, April 25, 2015. Especially since it provides no guidance on how the country will reach its goal of cutting its emissions by 80 percent by 2050. “So, that’s done. Now we have to think about how to do it in a different and more market-oriented way for 2050,” he added. The beginning of the end of coal? And by then, the government envisions a very different energy world. “In 2050, we are not going to [burn] lignite in Germany anymore,” Baake said. The end of lignite coal is decades away, however. Experts say it won’t happen until there is a way to store more of the fleeting energy from wind and solar, and until Europe builds the connections necessary to link the places that need power to the windy and sunny places that produce it. But there is a consensus across Germany that that day is coming. Perhaps most remarkably, even the miners’ union is talking about the end. Ralf Bartels, head of energy reform and sustainability for IG BCE, the union representing mining, chemical and energy workers, won’t put a date on it.